the ordinary process of cell division resulting in the formation of two daughter cells, by which the body replaces dead cells. The daughter cells have identical diploid complements of chromosomes (46 in human somatic cells). Cell division that results in haploid reproductive cells is known as meiosis. The period between mitotic divisions is called interphase, and mitosis itself occurs in four phases: prophase, metaphase, anaphase, and telophase. adj., adj mitot´ic. During interphase the chromosomes are extended long threads that cannot be visibly identified. The DNA of the chromosomes is replicated during this phase, resulting in duplication of the genetic material. During prophase the chromosomes coil up and contract, becoming short rods. Each chromosome consists of a pair of strands, called chromatids, held together at the centromere. At the same time the nuclear envelope disappears, and the centriole divides and the two daughter centrioles move toward opposite poles of the cell. During metaphase the chromosomes move so that their centromeres are aligned in the equatorial plane of the cell (the metaphase plate), and the mitotic spindle forms. The mitotic spindle is formed of fibers composed of microtubules, which extend from the centrioles to the metaphase plate and to the centromeres of the chromosomes. During anaphase the chromatids of each chromosome separate, becoming new daughter chromosomes, which are drawn to opposite poles of the cell by the spindle fibers. During telophase the daughter chromosomes arrive at the poles of the cell, where they are surrounded by two new nuclear envelopes as they begin to uncoil and extend. During this phase, cytokinesis, division of the cytoplasm, occurs. A furrow forms around the cell in the equatorial plane and deepens until the two daughter cells are separated. Originally, the term mitosis referred only to the division of the nucleus, which can occur without cytokinesis in certain fungi and in the fertilized eggs of insects. As used now, it usually refers to mitotic cell division. Mitosis shown as occurring in a cell of a hypothetical animal with a diploid chromosome number of six (haploid number three); one pair of chromosomes is short, one pair is long and hooked, and one pair is long and knobbed. From Dorland's, 2000. The usual process of somatic reproduction of cells consisting of a sequence of modifications of the nucleus (prophase, prometaphase, metaphase, anaphase, telophase) that result in the formation of two daughter cells with exactly the same chromosome and nuclear DNA content as that of the original cell. Mitosis shown as occurring in a cell of a hypothetical animal with a diploid chromosome number of six (haploid number three); one pair of chromosomes is short, one pair is long and hooked, and one pair is long and knobbed. 1. The process in cell division by which the nucleus divides, typically consisting of four stages, prophase, metaphase, anaphase, and telophase, and normally resulting in two new nuclei, each of which contains a complete copy of the parental chromosomes. Also called karyokinesis. 2. The entire process of cell division including division of the nucleus and the cytoplasm. a type of cell division that occurs in somatic cells and results in the formation of two genetically identical daughter cells containing the diploid number of chromosomes characteristic of the species. It consists of the division of the nucleus followed by the division of the cytoplasm. The former has four stages (prophase, metaphase, anaphase, and telophase), during which the two chromatids of each chromosome separate and migrate to opposite ends of the cell. Mitosis is the process by which the body produces new cells for both growth and repair of injured tissue. 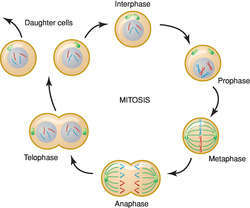 Kinds of mitosis are heterotypic mitosis, homeotypic mitosis, multipolar mitosis, and pathological mitosis. Also called indirect division. Compare meiosis. See also interphase. mitotic, adj. 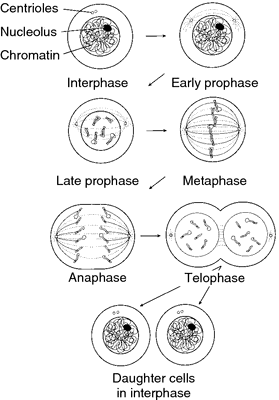 The usual process of somatic reproduction of cells consisting of a sequence of modifications of the nucleus (prophase, prometaphase, metaphase, anaphase, telophase) that result in the formation of two daughter cells with exactly the same chromosome and DNA content as that of the original cell. Prophase: The chromatin granules of the nucleus stain more densely; the DNA strands coil extensively and become visible as chromosomes. These first appear as long filaments, each consisting of two identical chromatids, the result of DNA replication. Each pair of chromatids is joined at a region called the centromere, which may be central or toward one end. As prophase progresses, the chromosomes become shorter and more compact and stain densely. The nuclear membrane and the nucleoli disappear. At the same time, the centriole divides and the two daughter centrioles, each surrounded by a centrosphere, move to opposite poles of the cell. They are connected by fine protoplasmic fibrils, which form an achromatic spindle. Metaphase: The chromosomes (paired chromatids) arrange themselves in an equatorial plane midway between the two centrioles. Anaphase: The chromatids (now called daughter chromosomes) diverge and move toward their respective centrioles. The end of their migration marks the beginning of the next phase. Telophase: The chromosomes at each pole of the spindle uncoil, the reverse of prophase, each becoming a long, loosely spiraled thread. The nuclear membrane re-forms and nucleoli reappear. Outlines of chromosomes disappear, and chromatin appears as granules scattered throughout the nucleus and connected by a lightly staining net. The cytoplasm divides (cytokinesis), resulting in two complete cells. This is accomplished in animal cells by constriction in the equatorial region; in plant cells, a cell plate develops in the same region and becomes the new cell wall. The period between two successive divisions is called interphase. Mitosis is of particular significance in that genes are distributed equally to each daughter cell, and the diploid number of chromosomes is maintained in all somatic cells of an organism. The first or reduction division in the maturation of germ cells. The second or equational division in the maturation of germ cells. The division of a cell nucleus to produce two daughter cells having identical genetic composition to the parent cell. First the long strands of CHROMATIN replicate and coil up to form dense chromosomes with the two copies (chromatids) joined at the CENTROMERE so that they appear X-shaped. At the same time, the envelope of the cell nucleus disrupts (prophase). Then two sets of strand-like microtubules (the spindle) appear, radiating from each end of the cell to the centre, the metaphase plate, and the chromosomes align themselves on the plate with the centromeres at the equator (metaphase). The copies of each chromosome (chromatids) now separate and move to opposite poles of the spindle (anaphase). Finally, the cell separates into two, the chromatin uncoils and the nuclear envelope of each reforms (telophase). a type of nuclear division by which two daughter cells are produced from one parent cell, with no change in chromosome number. Mitosis is associated with asexual growth and repair and, although it is a continuous process, has been divided up into four main stages, given below. Further details of each stage can be obtained by referring to individual entries. PROPHASE: chromosomes contract and become visible as threads. Each chromosome divides into two CHROMATIDS and the nuclear membrane disintegrates. METAPHASE: chromosomes migrate to the equator of a spindle and become attached to the spindle microtubes by their CENTROMERES. ANAPHASE: chromatids separate and go to opposite poles. TELOPHASE: nuclear membrane reforms, chromosomes lengthen and cannot be distinguished. See also MEIOSIS. Process by which a cell nucleus divides into two nuclei with chromosome numbers and genetic make-up identical to that of the parent cell. Mitosis is inhibited by anaesthetics and thus tissue repair is delayed. It is also slowed by hypoxia. Example: the mitosis of the basal cells of the corneal epithelium; the mitosis of the epithelial cells of the crystalline lens adding new cells to it which eventually form new lens fibres. See apoptosis; chromosome; corneal abrasion; Krebs cycle. Usual process of somatic reproduction of cells consisting of a sequence of modifications of the nucleus that result in the formation of two daughter cells with exactly the same chromosome and nuclear DNA content as that of the original cell. n a type of cell division that occurs in somatic cells and results in the formation of two genetically identical daughter cells containing the diploid number of chromosomes characteristic of the species. the ordinary process of cell division which results in the formation of two daughter cells, and by which the body replaces dead cells. The two daughter cells receive identical diploid complements of chromosomes, which are characteristic of somatic cells. Cell division that results in haploid reproductive cells is known as meiosis. The period between mitotic divisions is called interphase. 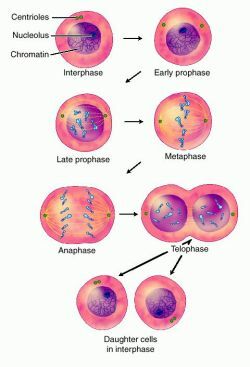 Mitosis itself occurs in four phases: prophase, metaphase, anaphase and telophase. proposed a semi-Markov model trained in a max-margin learning framework for mitosis event segmentation. Although finding is statistically not significant but increase in mitotic rate and presence of these atypical mitosis might be a significant pathological change if it persists even after cessation of stimulus. Mitosis beautifully combines a recognition of the sacredness of every human life with an appreciation of how interrelated our lives are. Contabilizado el numero de celulas en mitosis y el numero de celulas en total, se hallo el IM (indice mitotico), teniendo como indice mayor al tratamiento control, 16. The spindles, which come from the two poles of a cell when a cell enters mitosis or meiosis, are similar to two springs, each of which has its own polar-ejection forces because it gains energy during interphase. The phosphorylation of histone H3 is a rare event in interphase cells but is a process almost exclusively occurring during mitosis. En suma debido a los argumentos anteriores, el objetivo principal de este trabajo fue el de caracterizar por el metodo convencional de citogenetica los cromosomas en mitosis y meiosis de la poblacion de robalo blanco C.
During mitosis and the S-phase of the cell cycle H4 (and H2A) are both phosphorylated on Ser 1 (pSer1) in worms, fly and mammalian cells (Barber et al. Detection of the expression level of Cdc25B in cells is promising to represent a molecular index judging the mitosis index and reproductive activity of tumour cell (Zai et al. McAinsh (Marie Curie Research Institute, Surrey, UK) introduces mitosis as a phenomenally complicated process of the splitting of genetic material into two daughter cells that prevents genomic instability. And to illuminate cell division, or mitosis, he describes tying a string around a balloon and pulling to constrict it into two. Its role in mitosis of the embryo organizing the first mitotic spindle initiating the process of human development (egg activation) is now well established (6,7).